While there are widespread concerns that agricultural biotechnology might contribute to a further erosion of crop genetic diversity, in this chapter it is argued that the opposite could actually be true. Biotechnology allows for separation between the act of developing novel crop traits and the process of breeding plant varieties. As a result, a given biotechnology innovation may be incorporated into a large number of locally adapted plant varieties. This is confirmed by first empirical evidence from different countries. However, a theoretical model is developed which shows that the outcome is situation specific and depends on various institutional factors. 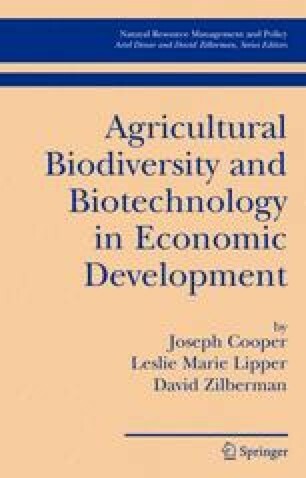 Local research capacities, intellectual property policies, and biosafety regulation schemes are identified as important determinants for the actual impact of biotechnology on crop genetic diversity. Policy implications are discussed with a particular emphasis on developing countries.